Pine trees are found all over the world which makes them a great tree to model on any model railroad or model diorama. In this tutorial I’ll show you a simple yet very realistic way of making pine trees that you might see walking through a dense forest, with long trunks and lush dark green canopies these trees will look fantastic no matter where you plant them on your layout. 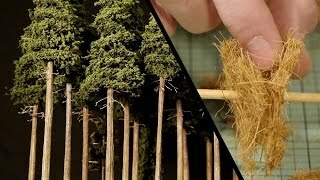 The trees in this video are made to HO scale however the technique as with nearly all of my other tutorials applies easily to any other scale. For more information and a list of materials go and check out and you’ll find all the additional information there as well as many other articles and videos. every little bit helps me bring these tutorials to you not to mention it really motivates me to do the best videos I can.